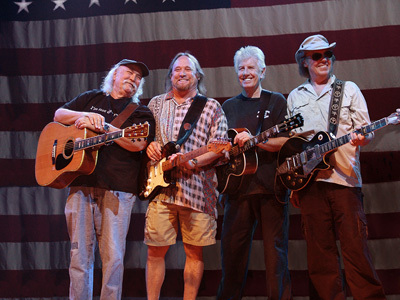 The eating of Crosby, Stills, Nash and Young follows a recent trend of gormandizing grizzled rock veterans. Earlier in the month, Deicide singer and all around nice guy Glenn Benton ate the leg of Scottish singer songwriter Donovan during a spirited version of “Hurdy-Gurdy Man”. Country Joe McDonald, of Country Joe and the Fish fame, survived an attack of bloodthirsty members of the band Malevolent Creation by hiding all night in an abandoned farmhouse waiting for police. Clearly, Morbid Angel’s devouring of an entire band was meant to up the ante and bring death metal to the next level. As of now, Morbid Angel has no plans to eat any other celebrities, although with the declining economy, many Americans are expected to resort to cannibalism as grocery store shelves become emptier by the day. Morbid Angel’s record label, Seasons of Mist has already begun to capitalize on yesterday’s events by selling tee-shirts with “Crosby, Stills, Nash, and Young” crossed out and replaced by “Breakfast, Lunch, Snack, and Dinner”. Rumors have circulated that a Morbid Angel human cookbook called “Morbid Angel Cooks With The Stars” may be available in time for Christmas. This entry was posted on August 6, 2011, 9:20 AM and is filed under General Weirdness. You can follow any responses to this entry through RSS 2.0. You can leave a response, or trackback from your own site. Well, if they survive the consumption, it’ll be a medical miracle, considering that CSN&Y had enough toxic substances in their blood to qualify as EPA Superfund sites! Guess it’s the old, “Whatever doesn’t kill you, makes you stronger”, eh? And might I suggest that the … um … “deposited residuals” of the meal be taken to the nuclear waste dump sites out west, and buried for a few millennia? No WAY I want to be downwind of THAT! I just may have to check these guys’ music out, considering the great gift they’ve given us. Or taken for us. Or something. HA! Sorry it took me a moment to get back on this one, I was trapped up on top of a mountain. Had to gnaw off my own arm to survive. Darnedest thing. You can check out as much Morbid Angel as you want now. There’s not much hope for improvement. But, it’s good to see them eating again.